Cassidy's works can be hard to track down; noticing a mention of Lower Peover in one book, we headed off into Cheshire by bicycle on Mother's Day, 2008 to investigate. Cassidy's signature just visible. 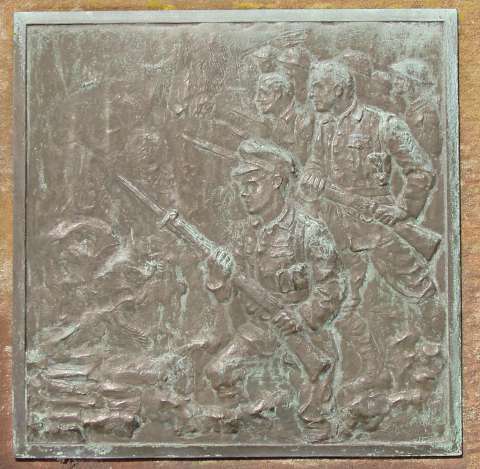 One source says these plaques are cast lead rather than bronze. Could this be correct? 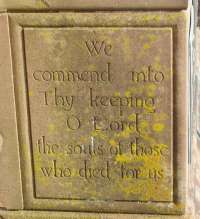 Inscription on the left-hand side of the plinth. 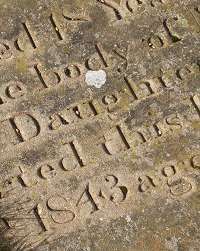 One of the old gravestones nearby; the carved letters are quite similar. 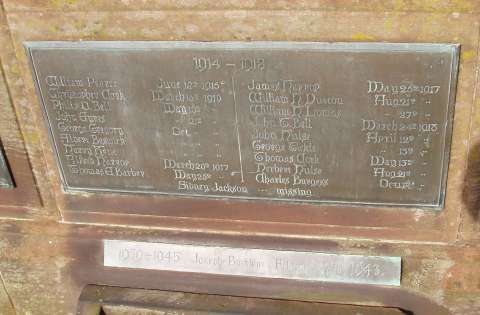 Cassidy's name and the date 1921 appear on the right-hand side of the plinth, not seen by most who look at the memorial. By late October 1916, the Battle of the Somme was entering its final stages. Advances had been made since July and the Cheshires were to become involved in an attempt to wrest the high ground away from the Germans. Capture of the ridge, which ran from Martinpuich to Thiepval, would allow the British strategic control of this sector. On 20 October, the Battalion assembled in Hessian Trench, prior to an attack on Regina Trench. The next day, the British artillery barrage started at 12.06pm, rolling forward across No Man's Land before falling on the German front line trench. The Cheshire's followed very closely behind, finding the barrage was protecting them, by preventing the German machine gunners from coming out of their dugouts. They advanced in three waves and, finding the enemy's barbed wire had been destroyed by the artillery, took their objective without much difficulty. The Battalion's War Diary records they "took about 250 prisoners and captured a machine gun. One party, advancing well forward, put a German field gun out of action, but was unable to bring it back". They now consolidated the position and held it until 6pm on the 22nd. The attack had been successful but costly. Three officers and 74 men had been killed. Another 120 were wounded and out of action. 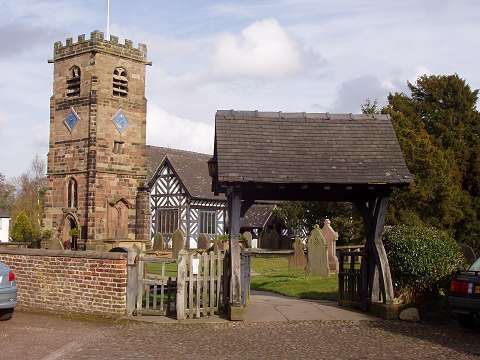 The Cheshire village of Lower Peover is a place of very different character to the gritty mill towns featured in most these pages, although only twenty miles away from the city of Manchester. 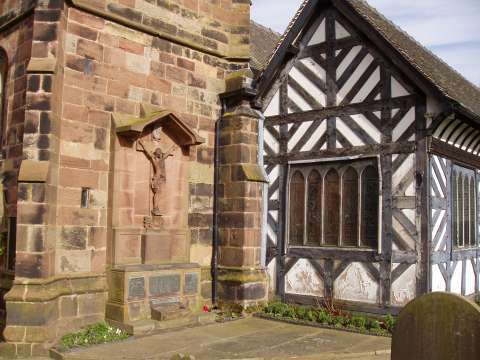 It is a small, and very picturesque, little settlement, with one of the few survivng churches in the county - the Parish Church of St Oswald - built in the traditional Cheshire 'black and white' timber-framed style. 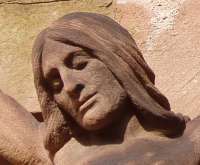 Cassidy's War Memorial, too, is very different to his other memorial works, with its focus on Christian imagery. 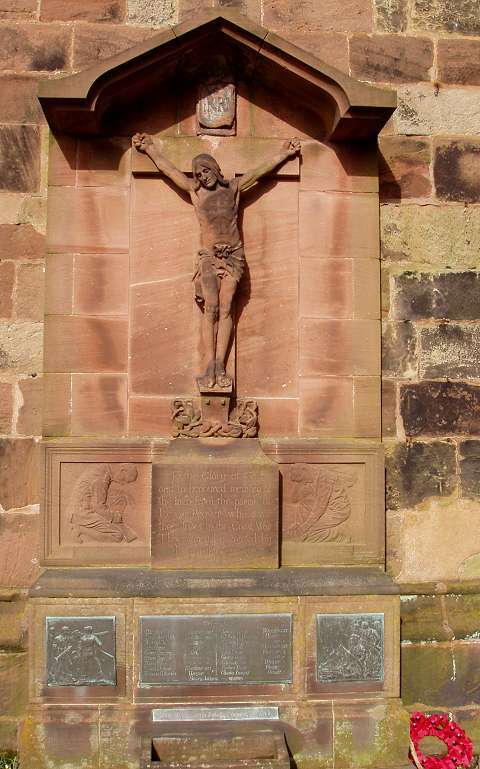 Created in Cheshire sandstone and mounted on the side of the tower (see the top picture), it features a crucifix as well as panels showing soldiers and sailors in both bronze and stone. 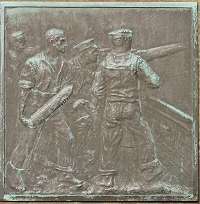 A closer view of the memorial in its context. 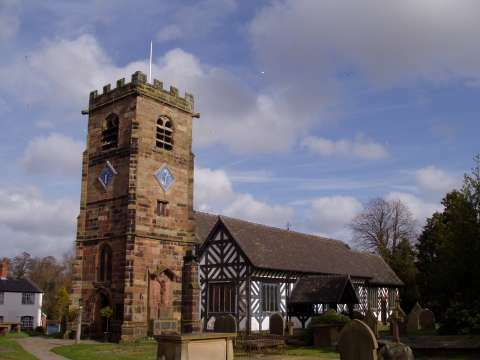 The church was founded in 1269 by Richard Grosvenor of Hulme Hall, although the oldest parts of the current building are believed to date from the 1300s; the stone tower is thought to date from the 1500s. The walls were rebuilt in the 1600s, while the present roof is from 1852. 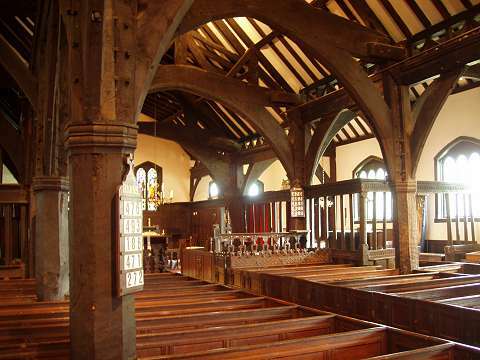 The original roof was a single gable, whereas the current version has separate gabled sections over the nave and the two aisles. 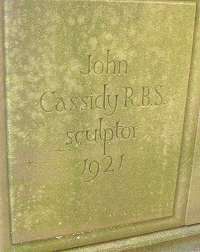 Cassidy's reliefs are in a freer style that some of his other work. 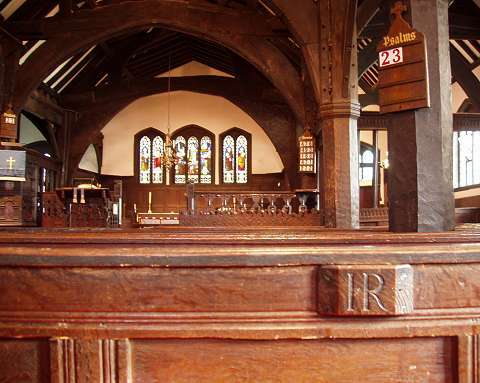 I was pleaasd to see that the church was open to visitors, not the usual situation for village churches in these times. 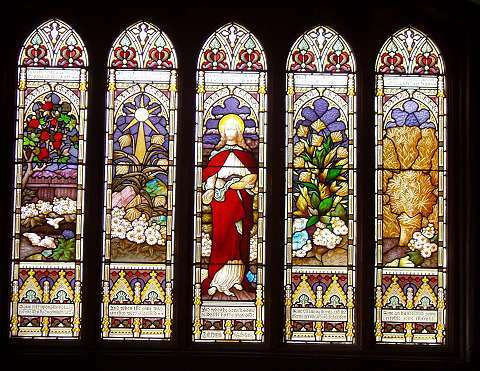 Any original stained-glass windows would have been destroyed in Puritan times: the current windows are modern, and very attractive. This is the view from inside of the window adjacent to the memorial. The theme is the Parable of the Sower (Matthew 13: 1-23), most appropriate for such a rural location. Nearby, that other essential feature of the English village, the village inn. 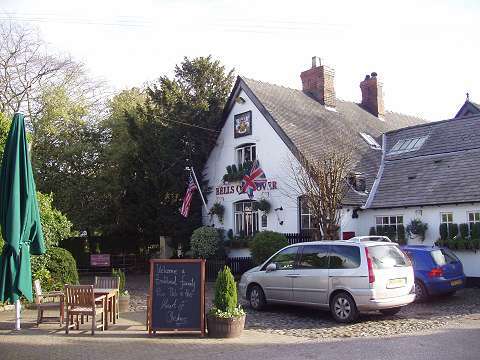 Now called 'The Bells of Peover' it was originally the Warren de Tabley Arms. In the early months of 1944, when American soldiers were billeted at nearby Peover Hall, their commanders, General Eisenhower and General Patton, made plans for the D-Day invasion of Normandy over lunch here: hence the flag of the United States flying alongside the British. Apparently, the name refers to the Bell family which once ran it, and not to the bells of the church as one might assume; it is now (2008) opened by that well-known British couple Chef and Brewer, and the day being Mother's Day was very busy.